Starting Sept 27, 2016, Tracfone will increase their reseller pricing further! In order for us to continue selling this product online, we have to charge 2% extra so we will not be losing on this product considering the costs of selling this online. However, you still save with us compared to local store or directly from the provider since we don’t charge sales taxes! Text Messaging Text messaging rates vary by phone: Nokia 1100, 2600, 3390 & Motorola V170, and C155 are 18 seconds/msg sent and FREE to receive. Nokia 5100, 1221, 2285, 2126 & Motorola C343, V60, and 120 are 30 seconds/msg sent and received. TracFone deducts minutes as units: 1 Unit = 1 minute of local or long distance calls made from inside your home calling area. 2 Units = 1 minute of roaming calls made from outside your home calling area. Subscriber must visit the Tracfone website and purchase international minutes. To add minutes via landline phone, call 1-800-867-7183, choose option 3 and follow voice prompts.If you have a promo code, add the 5-digit code right after the last digit of your PIN. (15-digit PIN + 5-digit promo code). For HELP, choose option 4, then 5 to speak with a customer service representative. ** Tracfone promotional codes can only be used once per phone. Tracfone promotional codes are provided by Tracfone Wireless and CallingMart.com does not guarantee their validity. TracFone Wireless is the largest independent nationwide provider of prepaid wireless communications. TracFone is a pay-as-you-go, prepaid wireless service that has the largest digital coverage area in the United States. There are no hidden charges, nationwide long distance is already included in your price, and there's never a roaming surcharge, just a flat rate. Plus, Tracfone offers all the full featured calling features such as caller ID, call waiting, 3-way calling, voicemail, text messaging, and inexpensive roaming (or free on GSM models). The unique thing about Tracfone is their patented airtime balance display and billing system. So you always know right where you stand with regard to how many minutes you have and when you need to get more. Although Tracfone Wireless is known to be more expensive than other competing providers, they do offer widely available promotional codes which can actually make the service a lot cheaper. 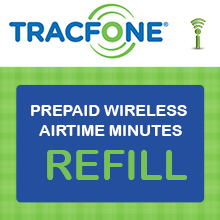 Tracfone Refill Minutes: Compatible with all Tracfone PAY AS YOU GO Prepaid Wireless plans. If you are uncertain as to what type of Tracfone Refill Minutes Plan you may have, please call our professionally trained customer service representatives toll-free at 1-877-6-Get-PIN (1-877-643-8746) from 10am to 10pm EST 7 days a week or visit our Wireless Prepaid FAQ section or Email us at [email protected]. After activating phone, select Redeem Airtime from your Prepaid menu. Enter 15-digit Airtime PIN (PIN Number) and press the OK key. Airtime will be sent directly to your TRACFONE. RapidRefill™ may not work with all phones. The Tracfone® logo and the Tracfone® product images are registered trademarks of Tracfone®. CallingMart is in no way affiliated with Tracfone® or any other entity for which a logo or name may be present. CallingMart refers to these logos and or names solely for the purpose of demonstrating the products and or services that it resells. - For technical assistance, please call 1-800-867-7183.